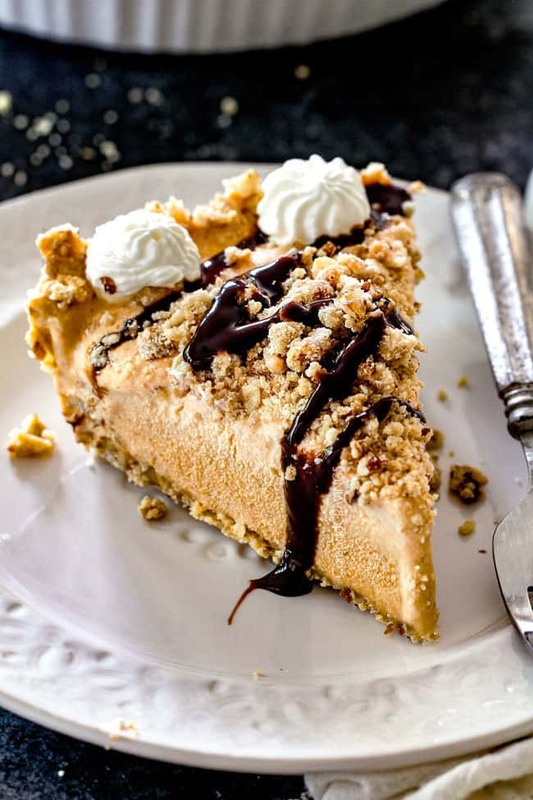 Pumpkin Ice Cream Pie is a creamy, crowd pleasing favorite that takes minutes to whip up and is the easiest, stress-free pumpkin pie for the holidays that you can make and freeze a week in advance! 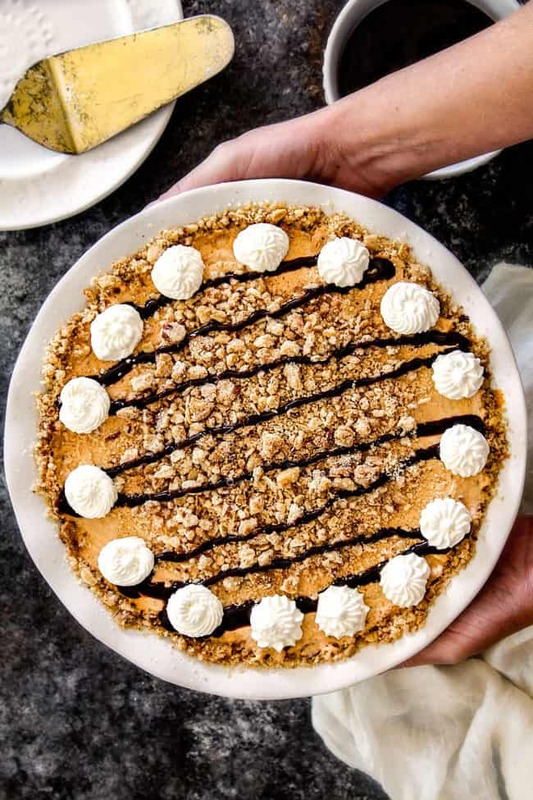 If you have ever been intimidated by traditional pumpkin pie, don’t love pumpkin pie, simply want a hassle free dessert OR a DELICIOUS dessert, then this Pumpkin Ice Cream Pie is for you! I was expecting to like this ice cream pie, but I LOVED this ice cream pie – and so did everyone else. Even the non-pumpkin pie lovers. 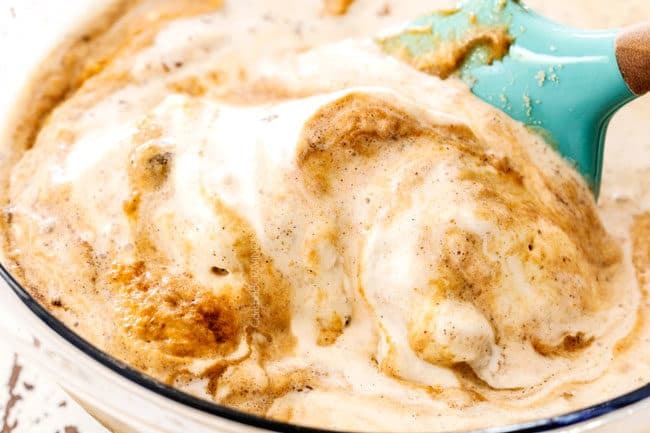 For example, my husband, Patrick, is not a huge fan of pumpkin pie but he could not get enough of this silky ice cream version. My mom broke her diet for this ice cream pie and my dad couldn’t stop at one slice. What is in Pumpkin Ice Cream Pie? This Pumpkin Ice Cream Pie looks every bit as impressive as traditional pumpkin pie, but requires minimal effort and tastes fabulous! 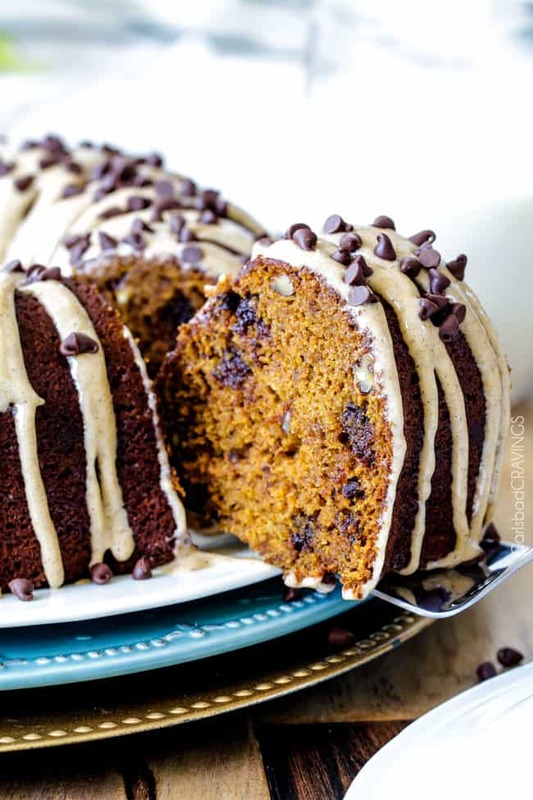 It is refreshing yet rich at the same time bursting with pumpkin goodness. 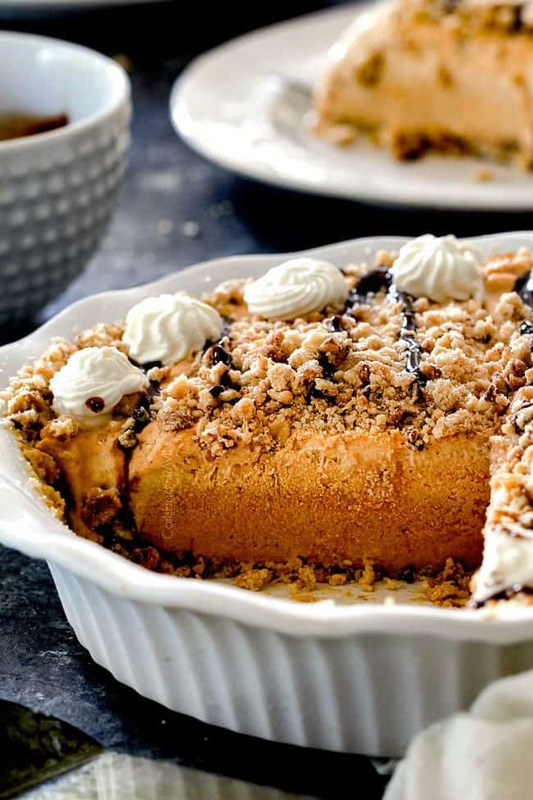 This ice cream pie is comprised of a luscious filling made from ice cream, pure pumpkin, brown sugar, cinnamon, ginger, and nutmeg, all cocooned in a buttery cookie crumble crust and drizzled with cinnamon Chocolate Sauce. 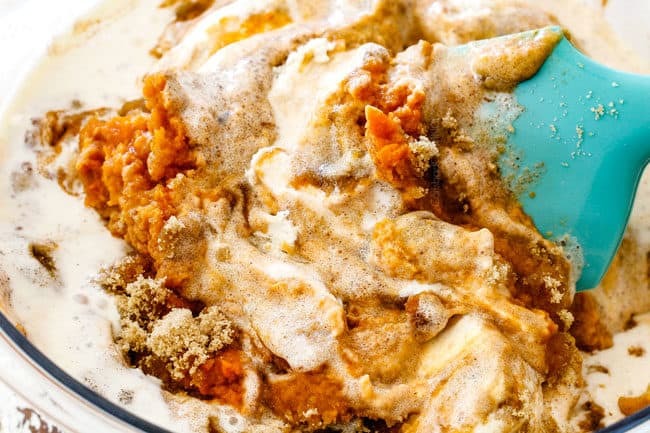 It is basically a pumpkin ice cream sundae with a fabulous contrasting crunch that everyone goes crazy for! 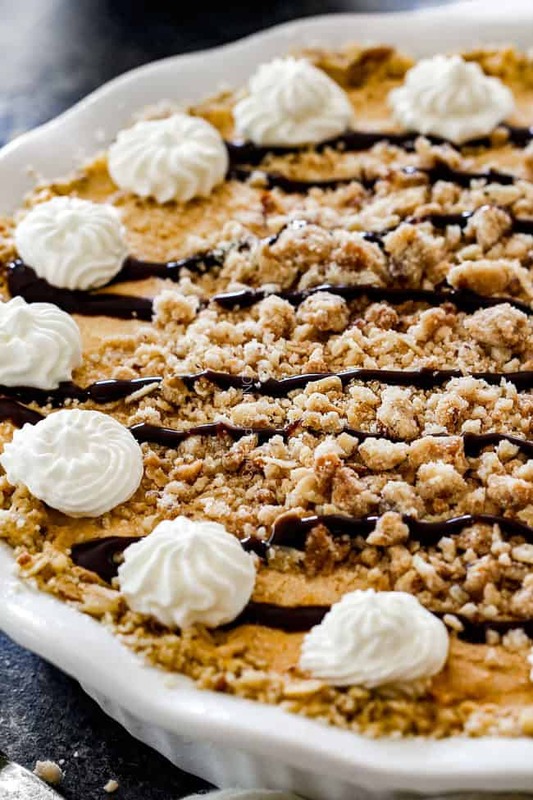 This Pumpkin Ice Cream Pie was inspired by a recipe from a friend’s old family cookbook. I played with the proportions, halved the crust from my Toffee Ice Cream Cake and added a Cinnamon Chocolate Drizzle because Chocolate + Pumpkin is magic. Ice Cream Pie is easy! This Pumpkin Ice Cream Pie uses pantry friendly ingredients and can barely be called a recipe because it is so easy! 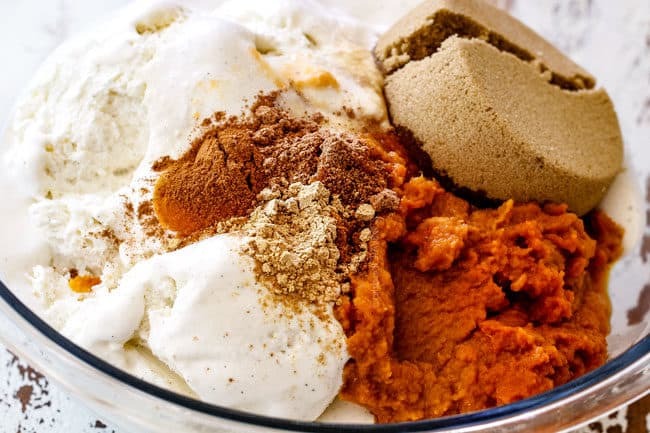 For the filling you simply mix together 3 ingredients (pure pumpkin, ice cream, brown sugar) plus a few seasonings. For the crust, there is no cutting in butter or rolling out dough, instead it is a no fuss cookie crumble with flour, softened butter, brown sugar and chopped pecans that you mix together. After you mix the ingredients together, spread it out on a baking sheet and bake until golden. 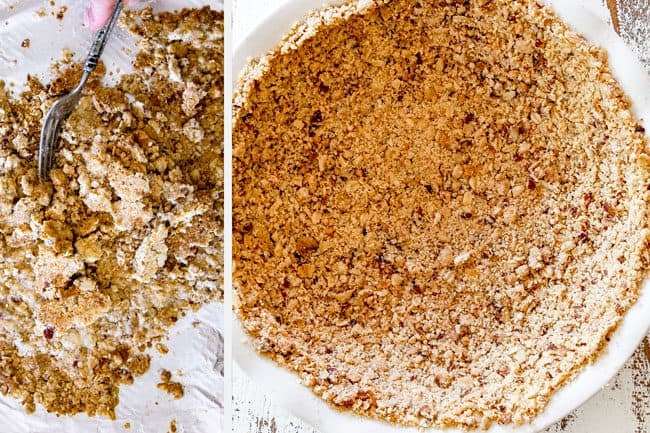 Finally, crumble the “cookie” and push it into your pie plate. 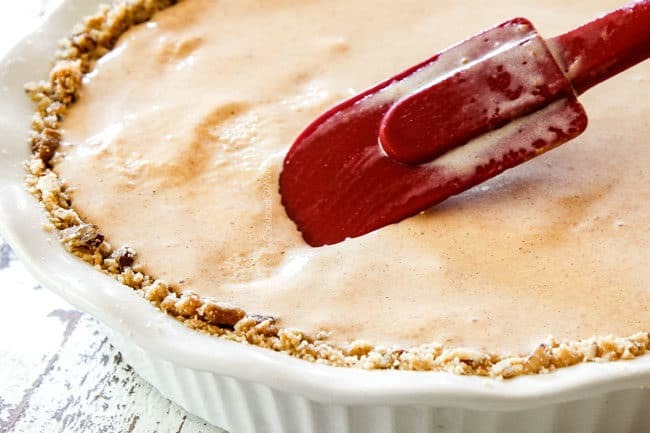 Alternatively, you can also use your favorite graham cracker or Oreo crust recipe or even use a store bough crust if you want the easiest ice cream pie in the world. Ice Cream Pie is Make ahead! Cooking multiple foods for Thanksgiving can be overwhelming and also tricky to manage with different cooking temperatures and times. It can also be stressful to cook when hosting family or getting ready to visit family. But never fear, you can leave all that stress behind as you and your ice cream pie chill. 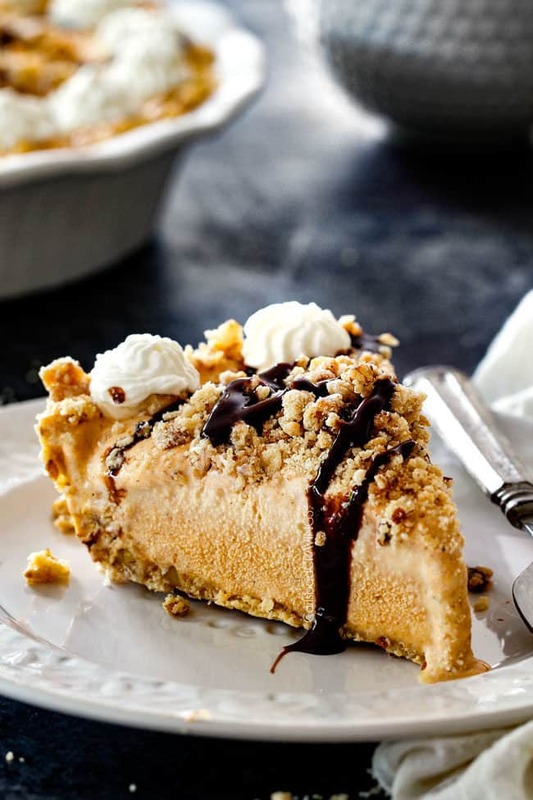 This ice cream pie is perfect for the holidays because you can make it WEEKS in advance and keep it in the freezer (make sure to securely cover) then pull it out at Thanksgiving for an instant dessert! Crush crumbs finely. When you break up the baked Cookie Crumble, crush the crumbs pretty small because they will be easier to work with and stick together better in the pie plate. Alternative crusts. I love the crunchy, buttery homemade cookie crust but you can also make your favorite Graham cracker crust or Oreo crust. Store bought crust. To make this the easiest pie ever, you can purchase a store-bought crust. I won’t tell. 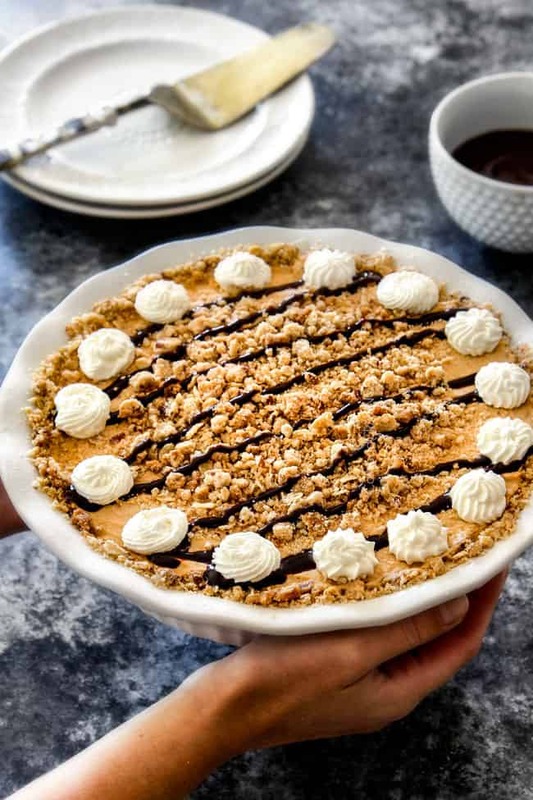 If you do this, you will want to add some texture on top of the ice cream pie (because you won’t have part of our cookie crumble to put on top) such as crushed Oreos, heath bars, etc. Quality Ice Cream. Take care to use quality vanilla ice cream for the best ice cream pie. Soften Ice Cream. You can allow your ice cream to sit at room temperature to soften but I cheat and microwave it at 10 second intervals. You don’t want the ice cream melted, but a soft, spreadable consistency. Store Bought Chocolate Sauce. 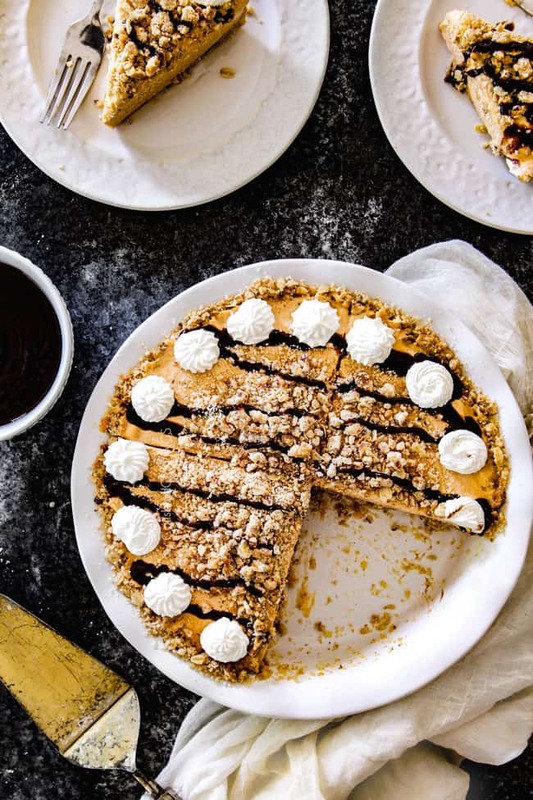 For this Pumpkin Ice Cream Pie, I drizzle it all with silky homemade Cinnamon Chocolate Sauce. The chocolate sauce takes less than 5 minutes to make and is sensational. That being said, you can use your favorite store-bought fudge sauce. Quality Chocolate. Use quality chocolate in the chocolate sauce for the best results because it is CHOCOLATE sauce. Corn Syrup. I add one teaspoon of corn syrup to my chocolate sauce because it keeps it wonderfully silky but you can omit it if you prefer. Reheat Chocolate. You can make your chocolate sauce at the same time you make your ice cream pie and refrigerate or you can make it when you are ready to serve your pie. If your sauce has been refrigerated then microwave it at 15 second intervals until liquid and smooth. To drizzle chocolate evenly, place it in a sandwich size plastic bag and snip a small piece of the corner off. Freeze level. Your pie will freeze in whatever position it is left, so take care it is even! Freeze long enough. You want to freeze your pie for at least 3 hours so it is very firm. This ensures it is frozen through and through and won’t fall apart when slicing. Let froze ice cream pie sit. If you don’t want your ice cream pie to tasty icy, make sure it sits out long enough so it tastes like ice cream and not icy ice cream. I can’t tell you exactly how long this will depend on how long it has been frozen, how cold the freezer is, how warm you home is, etc. but at least 10 minutes. Garnish pie. 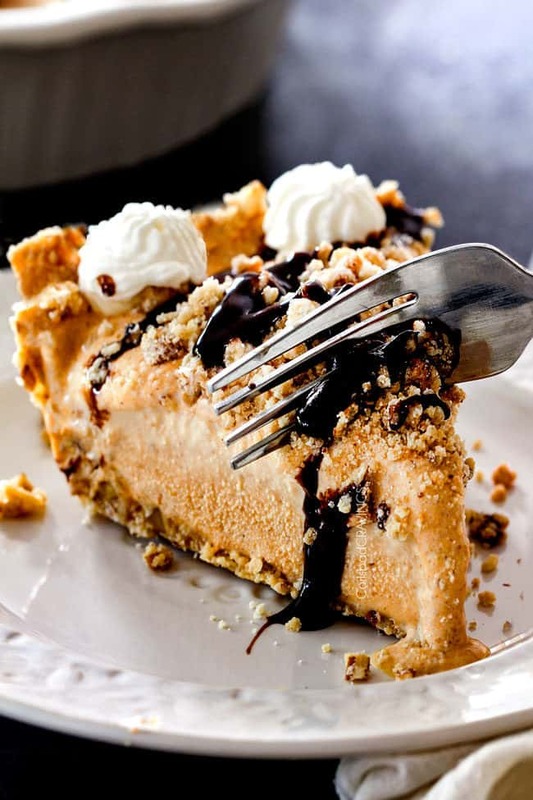 Individuals can garnish their pie with additional chocolate sauce and whipped cream if desired. You can even create an ice cream topping bar of candies such as heath bars, Oreos, etc. for individuals to garnish their pie with. 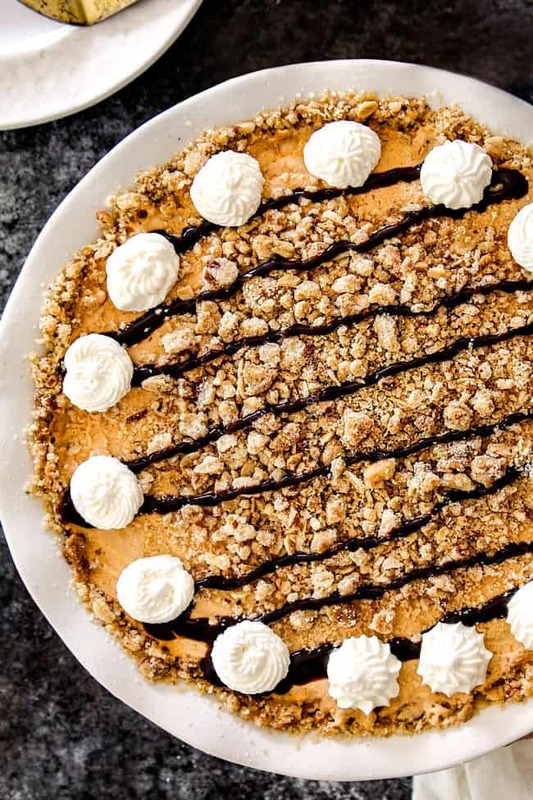 Want to try this Pumpkin Ice Cream Pie Recipe? Pin it to your PIE, DESSERT, THANKSGIVING or FALL Board to SAVE for later! Mix all of the Cookie Crumble ingredients together then spread evenly over a foil lined cookie sheet. Bake at 400 degrees for 10 minutes, or until lightly golden. Break up the baked Cookie Crumble. Set aside 3/4 cup to garnish pie. Press remaining crumble firmly into the bottom and up the sides of a lightly greased 9-inch pie pan to create crust. Mix all of the ingredients for ice cream filling until well blended then spoon over crust. Sprinkle with reserved cookie crumble and cover tightly with plastic wrap. Freeze until completely firm, at least 3 hours (may freeze for days-weeks ahead of time). If freezing for an extended period of time, double wrap in plastic wrap then wrap in foil to avoid freezer burn. Melt butter in heavy cream in a medium saucepan over medium heat, stirring occasionally. Once butter has melted, stir in chocolate until melted and smooth. Stir in corn syrup, vanilla and cinnamon. Remove from heat and cool to room temperature. Use immediately or store in an airtight container in the refrigerator for up to 2 weeks. To reuse, heat in the microwave or on the stove. Let pie sit out for 10-20 minutes before serving. Garnish with whipped cream if desired and drizzling with chocolate sauce. 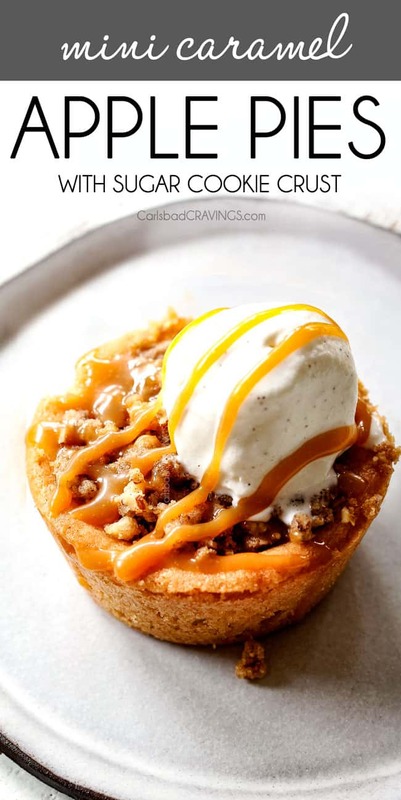 This looks like another homerun from Carlsbad Cravings! I just made your Pumpkin Bars with Nutella Frosting for a work party and they were a huge hit! I am making your pumpkin crepes tomorrow and your pumpkin cookies next week (they are a family favorite). I am excited to try this pumpkin ice cream pie too. 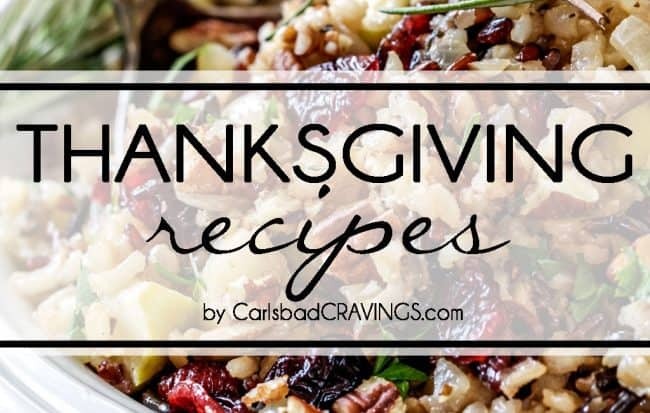 Thanks for not only posting unique, flavorful dinners but fun and easy holiday recipes too! You are so welcome Beth, I am so pleased you are enjoying all of the fun Fall baking recipes! I have so many I want to post but too little time 🙂 I’m thrilled both the Pumpkin Bars and Cookies are favorites and I’m excited for you to try the Pumpkin Crepes and this ice cream pie! Happy Baking! This looks wonderful! I especially love that it is freeze ahead. 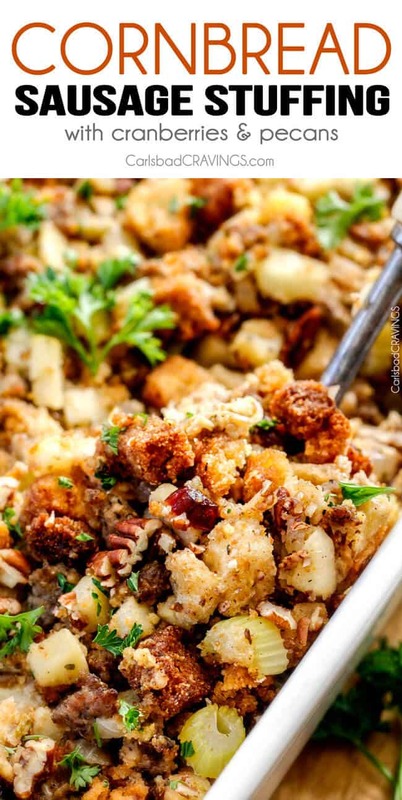 I am definitely adding this to my Thanksgiving menu! Thanks Jen! You’re welcome Heidi! I love that it is freeze ahead too – sooo convenient! You will love how delicious it is too! Oh my! The family is in for a new twist on pumpkin pie this year, and all due to you. This is delightful and I can make it ahead of the rush. But I’d better make 2 in case a taste test or two arise before Thanksgiving! LoL! Thanks for the great menu ideas! YAY! I’m so happy you are going to make this for Thanksgiving – I think the whole family will love it. And I definitely agree a taste testing is in order 🙂 Thanks Linda!